We boast a wide range of beautifully made curtains, blinds, awnings, sails and flyscreens to help improve your home and make it the best it can be. 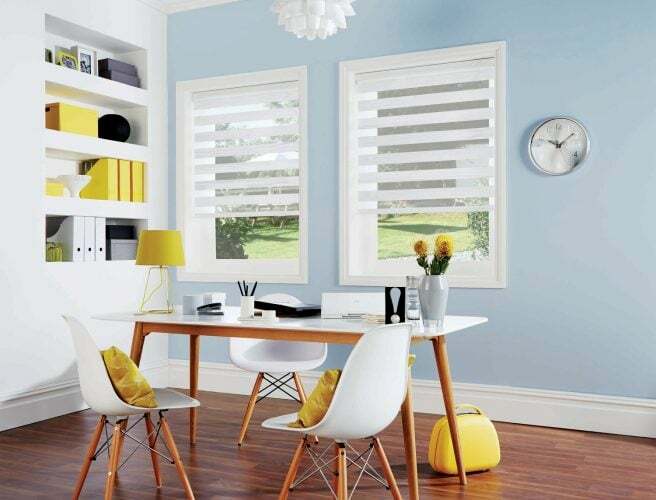 Included in our ranges, are specialist blinds for children’s bedrooms, hygienic ultra-fresh blinds for bathrooms and kitchens, and even blackout blinds for those of you who have trouble sleeping, work night shifts or have little ones who need a helping hand to get off to sleep. For a sophisticated feel, take a look at vision/visage blinds, which feature an innovative type of fabric to filter our light and give privacy. Book a consultation – we will visit you at your premises to discuss options, advise on the best solution for your windows, and can show you a range of samples. The blinds or curtains will then be made to order and fitted for you once they are ready and quality-checked by us. Book a design consultation online. Visit our one of our Norfolk showrooms. View our range of domestic products. Case Study: Roman Kitchen Blind Fitted In Taverham, Norwich. The fabric chosen for this kitchen roman blind meant that we had to be extra careful to get the pattern repeating in the right way. We wanted the blinds to look as good when they were open as they did when they were closed.